A just-released report finds that lawyers and law firms can and should do less law. (For background on #DoLessLaw, see my prior post, written with Tim Corcoran, a Taxonomy of Do Less Law). Examples of the problems arising from poor tradeoffs include law firms delivering “way too much relative to what we are asking for” and pushing forward on the merits ignoring the client wanting to “end the case quickly”. CEB puts the onus on GCs to cause firms to do less law. They found that in-house lawyers must “set clear work quality expectations, align legal risk tolerance, [and] specify matter execution priorities”. While matters are active, GCs must make clear the company’s clear risk preferences and provide “tools and decision rules to make correct matter trade-offs”. Of equal note, CEB finds that many popular GC programs do not address law firms doing to much law: success fees or AFA, panels, using Global 200 firms, or preferred firms. 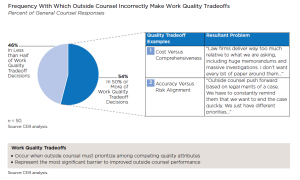 To address law firm over-investment, GCs have to manage better. 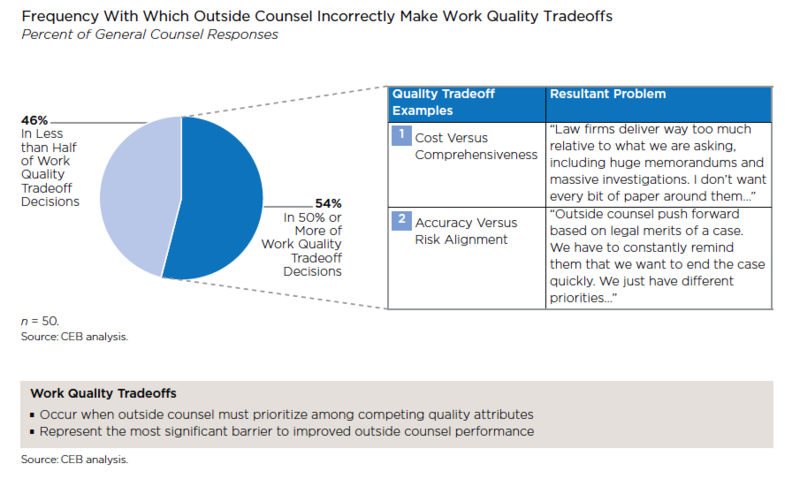 Only 13% “help outside counsel make necessary trade-offs” and only 29% evaluate firms on “the quality of their decision making, judgment and tradeoffs”. That leaves much room to improve. This report marks a milestone in my view. It clearly articulates and supports with data the potential to reduce spend by doing less law. As with any other law firm changes, the impetus must come from the client.